The vast majority of Chinese say that their country is on the right path – more than eight-in-ten say things in China are going well and that the economy is strong. Nonetheless, the country is not immune from economic fears – even in China, with its growing economy and high levels of national confidence, economic issues are foremost on people’s minds. Almost everyone worries about rising prices and a growing gap between rich and poor, and many are concerned about unemployment as well. Corruption and environmental problems also are high on the list of national problems. In general, the government receives positive reviews for the way it handles these issues, although poorer Chinese are a little less likely than those with higher incomes to say the government is doing a good job. Overall, the Chinese public is content with the direction of the country. In fact, among the 24 nations included on the 2008 Pew survey, the Chinese express the greatest level of satisfaction with the way things are going in the country – 86% are satisfied, 25 percentage points higher than the next highest country, Australia. 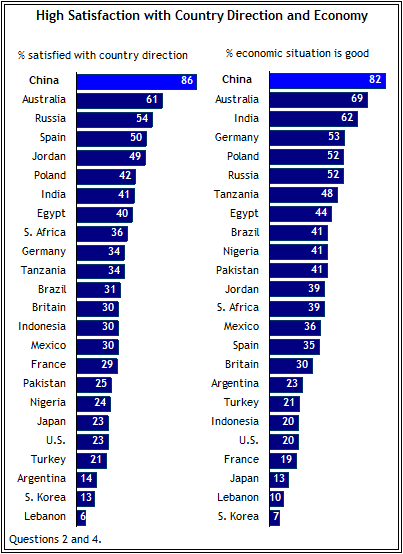 The Chinese also are the most satisfied with their country’s current economic situation – 82% say the economy is good. Again, Australia comes in a distant second at 69%. Despite the overall contentment with the nation’s direction, the Chinese public sees a variety of problems threatening the country. And despite China’s remarkable economic growth over the last several years, economic problems top the list of concerns. Worries about inflation are especially common. With near unanimity, Chinese consider rising prices as a big problem for the country (72% say it is a very big problem). The second most important issue also involves economics: almost nine-in-ten (89%) consider the gap between rich and poor a big problem, and 41% describe it as a very big problem. Meanwhile, unemployment ranks fifth out of the 17 issues tested on the survey – 68% say it is a big problem. Economic worries are common among Chinese at all income levels. For instance, even among those with high incomes, 65% say rising prices are a very big problem for the country. Still, concerns about inflation, the gap between rich and poor, and unemployment are slightly less intense among the wealthiest in Chinese society. Concerns about both the gap between rich and poor and inflation are especially prevalent in medium-sized towns (76% worry about inflation; 53% worry about the rich/poor gap). Those who live in towns (25%), as well as those in cities (25%), are more worried about unemployment than those in rural areas (15%). Rising prices are a particularly important concern in the western portions of China included in the survey (78% call inflation a very big problem) and concern about unemployment is higher in both the central and western areas (25% and 27% respectively) than in the eastern region where only 16% see joblessness as a major concern. People age 30 to 39 are more likely than those in other age groups to worry about economic issues – 76% call rising prices a very big problem, 47% say this about the gap between rich and poor, and 26% are very concerned about unemployment. Only very minor differences are recorded between men and women, or among educational groups, on these economic problems. Corruption – in both political and business circles – ranks high on the list of concerns. Nearly eight-in-ten Chinese (78%) believe corrupt officials are a big problem in their country, and 39% say they are a very big problem. About six-in-ten (61%) name corrupt businesspeople as a major problem and 21% consider them a very big problem. Worries about corruption are common across all segments of Chinese society. Environmental problems also are a major concern of the Chinese public. 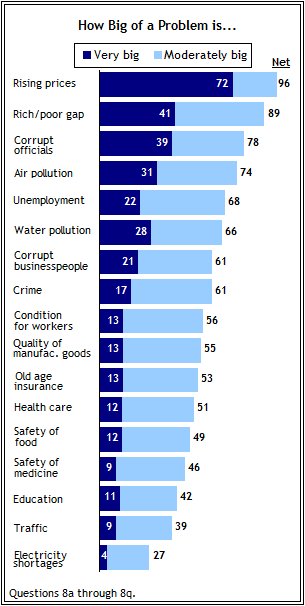 About three-in-four Chinese say air pollution is a big problem, and 31% say it is a very big problem. Water pollution is identified as a big problem by 66% and a very big problem by 28%. Highly educated respondents and residents in the central part of China are especially worried about air and water pollution. Among those with a college education or more, 79% call air pollution a big problem, while 74% say this about water pollution. In the central region, 84% rate air pollution and 73% rate water pollution a major problem. About six-in-ten Chinese think crime is a big problem in the country and 17% rate it a very big problem. Concern about crime is down considerably, however, from 2002, when 89% said it was a big problem and 40% rated it very big. Majorities also see working conditions, the quality of manufactured goods, old age insurance, and health care as big problems. More than 40% are concerned about the safety of food, the safety of medicine, and education. Slightly fewer than four-in-ten (39%) name traffic as a major problem. Traffic woes are more commonly cited among city dwellers (44%) and those with a college education (48%). These same two groups also are more concerned than others about electricity shortages (30% of city residents and those with a college education say they are a big problem), although overall, electricity shortages are seen as a problem by relatively few Chinese – just 27% say they are a big problem, and only 4% say they are a very big problem. Most of those surveyed say the government is doing a good job on the issues that are most important to them personally – 65% say the government is doing either a very (2%) or somewhat (63%) good job, while only 28% believe it is doing a somewhat (24%) or very (4%) bad job. Satisfaction with the government’s performance is somewhat lower, however, among lower-income Chinese – while 59% give the government a good rating on the issues they care most about, about one-in-three (34%) says it is doing a bad job. About seven-in-ten among high-income (72%) and middle-income (71%) respondents give the government a positive review. Ratings also vary by region, with those in eastern China (75%) giving the government more favorable marks than those in the central (60%) or western (58%) regions covered by the survey. Residents of medium-sized towns (62%) are slightly less likely to approve of the government’s performance than those in cities (68%) or rural areas (67%). 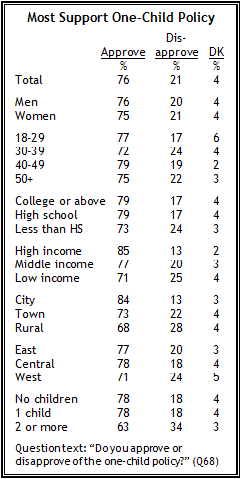 Views of the government are relatively uniform across gender, age and educational categories. Since 1979, China has had a “one-child policy,” which generally restricts couples to a single child, although there are exceptions. For instance, ethnic minorities are allowed more than one child, as are residents of rural areas. Some cities allow families in which both parents are only children to have additional children. And some couples simply ignore the law and pay a fine for having two or more children. This poll shows that the one-child policy is largely popular with the Chinese public – three-in-four (76%) approve of the policy, while only 21% disapprove. 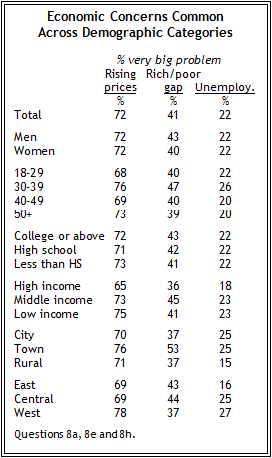 Approval is particularly high among those with higher incomes (85%) and those who live in cities (84%). Individuals who have two or more children under the age of 18 living at home are less likely to support the policy, although even in this group, 63% approve of it. Within China there have been several high-profile recalls of Chinese-made products over the last year. 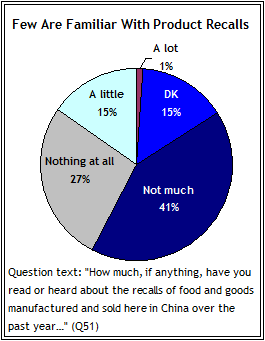 However, relatively few among the Chinese public are aware of these domestic recalls. Only 1% have heard a lot about this issue, while another 15% say they have heard a little. About four-in-ten (41%) say they have not heard much and 27% report hearing nothing at all. In contrast, in many other nations, large majorities are familiar with recent recalls of Chinese products in their countries. Indeed, 96% of Japanese, 88% of South Koreans, 81% of Americans, and 72% of Germans have heard about this issue.